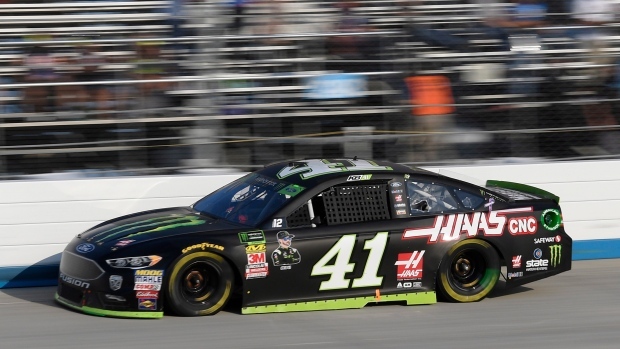 TALLADEGA, Ala. — Kurt Busch led a Stewart-Haas Racing sweep to put all four of the company cars up front at Talladega Superspeedway for a critical playoff race. Busch turned a lap at 195.804 mph to qualify in the top spot for Sunday's race. He edged teammate Clint Bowyer, who qualified second, ahead of Kevin Harvick and Aric Almirola as the Ford horsepower built by Doug Yates' engine shop proved superior in qualifying. "Four Stewart-Haas Racing Fords up front, I'm just happy I had the fastest one," said Busch, who won his first career pole at either Daytona or Talladega, the two biggest and fastest tracks in NASCAR. All four SHR drivers are still part of the 12-driver championship field, which will be trimmed by four following next weekend's race at Kansas. Almirola and Bowyer are tied for ninth on the playoff grid, barely holding on to transfer positions. "I've got to beat and differentiate and separate myself from my teammate, Aric, we're both 10 points out," Bowyer said. "I've got to capitalize on that somehow and close that gap here." "All four guys in the top 12 is a strong showing for us," Byron said. "Qualifying doesn't reflect totally on how things will shake out Sunday and how you are going to race. But it should be fine. With the four of us together at the start, we have an opportunity to stay in front of some of the possible situations." "We certainly qualified better that we expected to," said Kyle Busch. "The guys that qualified good are the ones you would expect to." Talladega had an "enhanced weekend" in which Cup cars were on track two days instead of three, with just one practice session prior to Sunday's race. It as a fast session, too, as Harvick led 23 other drivers to speeds over 200 mph. Harvick topped the practice board at 204.227 mph. Richard Petty Motorsports had just one superspeedway car to bring to Talladega Superspeedway so Bubba Wallace has been on his best behaviour all weekend. Wallace had to complete both a practice session and Saturday qualifying without harming his Chevrolet because RPM did not bring a backup car. RPM's car count is down because of a struggle to land sponsorship for Wallace, the only black driver racing fulltime at NASCAR's national level, and bringing just one car to Talladega is, as Wallace said, "ballin' on a budget." "Money is the root of all evil and success for us," Wallace said. Wells' career began in 1981 at Rockingham Speedway and he became a fixture in both NASCAR and the sports broadcasting community. Wells directed Richard Petty's final race, Dale Earnhardt Sr.'s final win, Jeff Gordon's four Cup Series championships, and Jimmie Johnson's record-tying seventh Cup Series championship. Following Sunday's race, Wells will shift into IndyCar mode and prepare for NBC's first-ever coverage of the Indianapolis 500 next season. The network is taking over the IndyCar package next season and Wells is in charge of "The Greatest Spectacle in Racing." "While it's bittersweet for this to be Mike's final NASCAR race for us, we can't think of a better person to direct NBC's inaugural Indy 500 in 2019," said NBC executive producer and president Sam Flood.